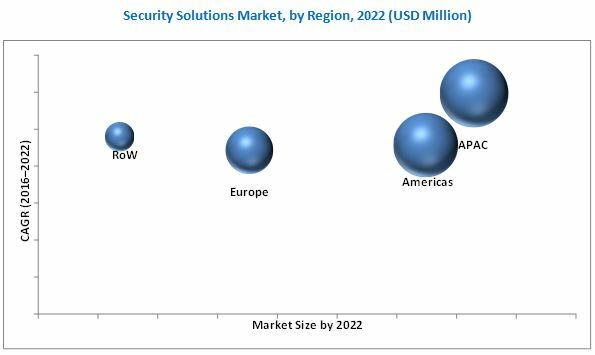 [220 Pages Report] The security solutions market is expected to reach USD 372.90 Billion by 2022 at a CAGR of 10.16% between 2017 and 2022. The base year considered for the study is 2016, and the forecast period is between 2017 and 2022. The growth of the security solutions market is driven by factors such as the necessity to safeguard individuals as well as property from rapidly evolving threats, increasing consumer awareness & security concerns, willingness to pay for security systems, growing demand for the deployment of wireless technology in security systems, and adoption of IoT-based security systems. The report aims at estimating the market size and future growth potential of the security solutions market based on type, end-use industry, and region. The report analyzes the market structure by identifying various subsegments of the security solutions market. It aims at identifying the major market trends and factors driving or restraining the growth of the market and its various submarkets. It also analyzes the Porter’s Five Forces model in detail along with the value chain analysis of the market, along with opportunities in the market for stakeholders by identifying the high-growth segments of the security products ecosystem. It strategically profiles the key players in the market and comprehensively analyzes their market size and core competencies in each segment. The research methodology used to estimate and forecast the security solutions market begins with capturing data on key vendor revenue through secondary research. Some of the secondary sources used in this research include information from various fire protection associations and organizations such as the National Fire Protection Association (U.S.) and Security Solutions Magazine (Australia), among others. Vendor offerings have also been taken into consideration to determine the market segmentation. The security solutions market ecosystem includes research & development associations, manufacturers & suppliers, wearable product manufacturers, software solution providers, and end users. 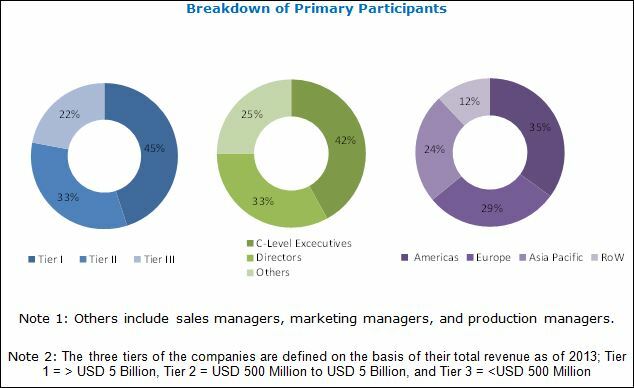 The security solutions market comprises major players, such as ASSA ABLOY AB (Sweden), Bosch Security Systems (Germany), Honeywell International, Inc. (U.S.), Tyco International Ltd (U.S.), UTC Fire & Security (U.S.), ADT Corp(U.S.), Alarm.com (U.S.), Allegion (U.S.),Control4 (U.S.), Godrej & Boyce Manufacturing Company Limited (India), Ingersoll Rand Solutions (Ireland), Nortek Security & Control LLC (U.S.),Hikvision Digital Technology Co.Lt (China), SECOM Co., Ltd (Japan), Stanley Security Solutions (Indiana), Axis Communications AB (Sweden), Zhejiang Dahua Technology Co., Ltd (China). Market size for 2017, 2019, and 2021 for segments such as type, end user industry, and geography.